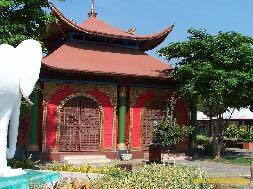 One of Surabaya tourism objects that is quite popular in South-East Asia is Four Faces Deity Statue or Four Faced Buddha monument. 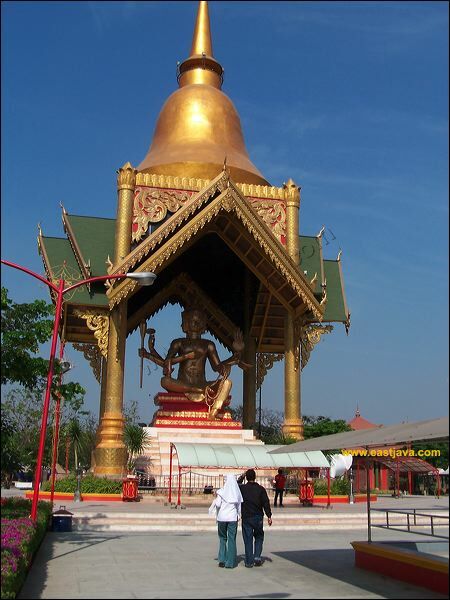 The Buddha Monument gets appreciation from MURI as the biggest and tallest Four Faces Deity Statue in Indonesia. The Four Faced Buddha monument has a total 36 meters (including dome) height. 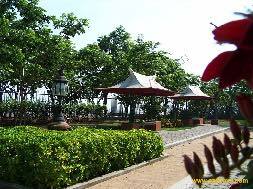 It is opened for public on 9 Novembers 2004, and it consumed Â±4 billion rupiahs. It is built in farm with a width of 1,5 hectares, inside a building with length 9 meters, wide 9 meters and height 36 meters. If we see altogether, it contains of number 9, beside it referenced by similar monument in Thailand, the number 9 is also has special meaning for Buddhists. Looking at this building design, it looks similar to Four Faced Buddha Monument in Thailand. The difference is only on the height of the statue, Thailand statue is taller but Surabaya monument has smaller building. Besides the resemblance of the measurement, the statue also has four faces and four hands, it totally gold-coated on all of its body. 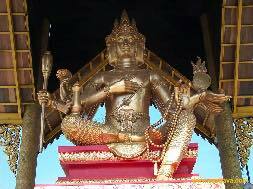 In order to do a perfect gold veneering process, kampoh material or original gold paper were imported from Thaila. The Four Faced Buddha statue symbolized four philosophy kindness owned by Buddha, those are patience, liberal, fair (unbiased), and meditated. 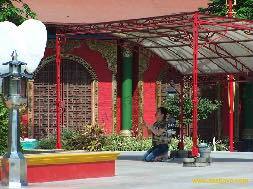 This four kindness is also had a meaning of Buddha, as the presentation of affection of fellow being, it assists whoever without discrimination, and devoted in prayer or application that submitted in ritual procession. On Buddha eight hands there are holy book, holy water, and defense weapon to fight against the badness, holy book, prayer beads, chest, and cupu. Besides the philosophy, this place is also the center of Buddhists observance. Other than the four faced deity statue, there are also four 4 meters high white elephant statues in every corner, three lotus decorative pools, and a meditated space. The complex is decorated by 12 lamps made of bronze and copper.